?13,140,000 minutes. How do you measure a marriage of 25 years? In daylights, in sunsets, in laughter, in miles. ??? The Southern Hemisphere with its raw natural beauty, technicolor skies, and crystal clear water hosted a surreal silver anniversary for my husband, Miguel, and I. For eleven days upon the ship m/s Paul Gauguin our most pressing matter was what time we’d like breakfast delivered to our stateroom. 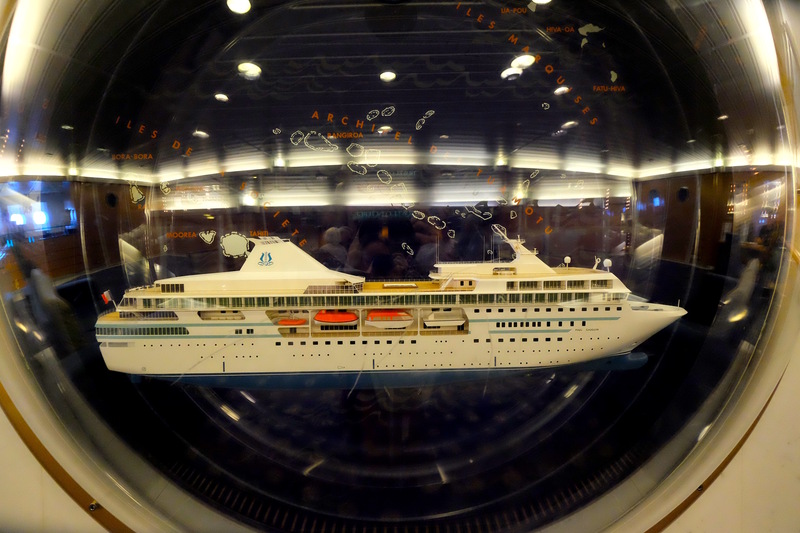 The crews’ polite graciousness was second to none; undoubtably one reason the luxury liner has won myriad World’s Best awards. Great Britain’s Captain Cook was the first foreigner to reach Tahiti in 1769. 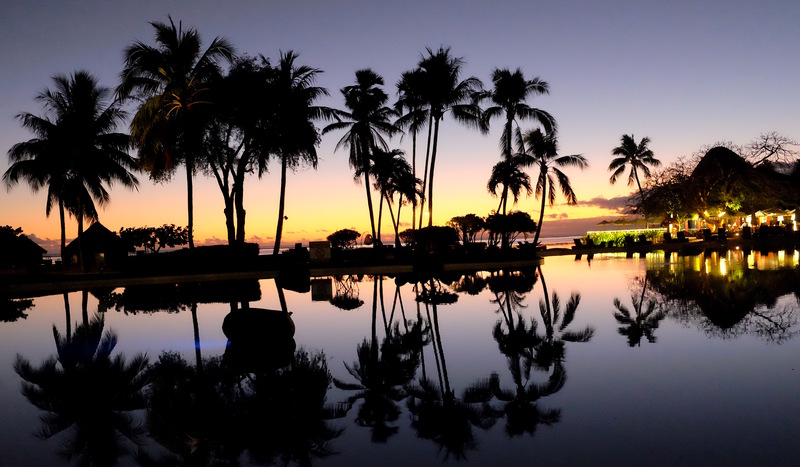 Two decades later, Captain Bligh sailed the HMS Bounty to this Pacific paradise. But, Bligh’s tyrannical ways and the lure of gorgeous Tahitian women lead his men to mutiny, which many years later inspired the book Mutiny on the Bounty. Authors’ James Norman Hall and Charles Nordhoff lived on Tahiti while writing the tome. Thankfully, our visit was more blissful, full of hoots and laughter mingled with seabirds’ voices. The first morning this magnificent sunrise greeted us as we anchored off the tiny, eight square mile atoll of Aitutaki in the Cook Islands. The land was dotted with coconut, pineapple, banana, and tapioca groves. Most of the 2,500 residents live in villages and zoom around the roads on motor scooters. The crystal clear turquoise water was perfect for snorkeling. We saw fish of every shape, size and color. The reefs were teeming with marine life. We took a stroll on this GORG beach. 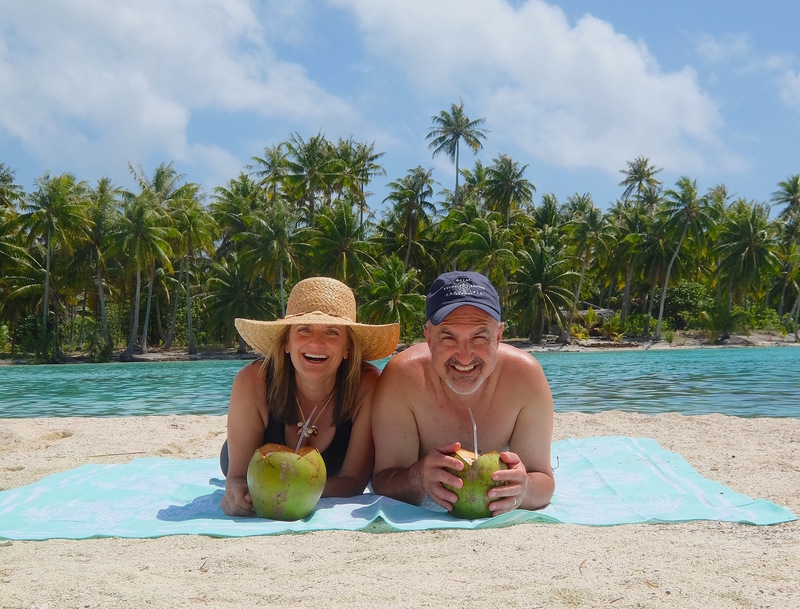 After our idyllic day, we boarded the ship bound for another beautiful Cook Island – Rarotonga. It was quite an adventure getting there. Before setting sail, our captain said over the loud speaker in his thick Croatian accent “ladies and gentlemen, the wind has picked up considerably resulting in 12 foot sea swells. It’s going to be a bit rough out there .” Okay, let me translate…batten down the hatches and get out the barf bags! Our 500 foot vessel was tossed about like a toothpick plunging into the bowels of satan. Most the 320 passengers, plus a few crew members, were bedridden. There wasn’t a Dramamine strong enough to quell the nausea. Eventually, off in the distance, land ho! Our commander’s stellar nautical abilities delivered us to terra firma unscathed. Rarotonga is the largest of the 15 Cook Islands. Its name stems from “raro” meaning down and “tonga” meaning south. The population is roughly 18,000. Jagged peaks and steep valleys offer great hiking opportunities. But, my queasy stomach couldn’t take more ups and downs, so I opted to shop the boutiques along the coast. The Society Islands were calling. 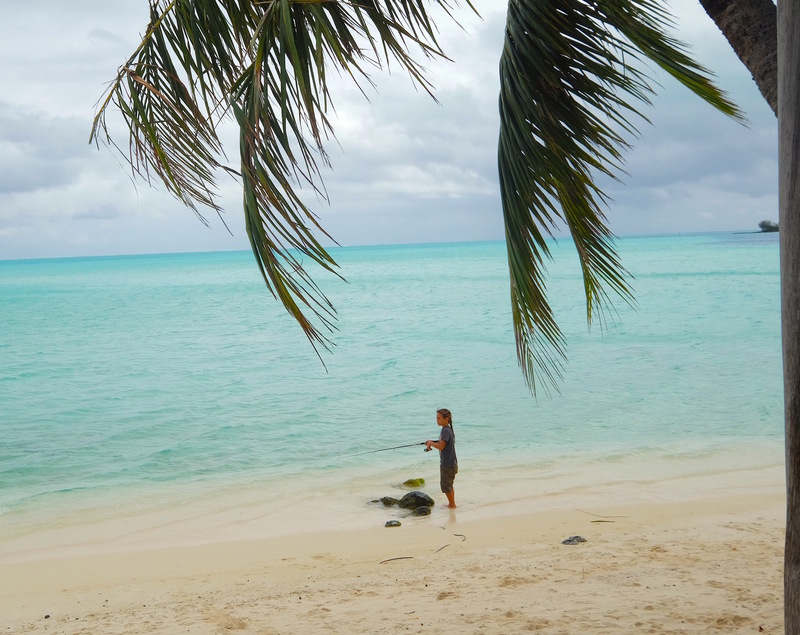 After two days exploring Cook Islands far flung atolls, we cruised north to Bora Bora. It was love at first sight when we arrived! 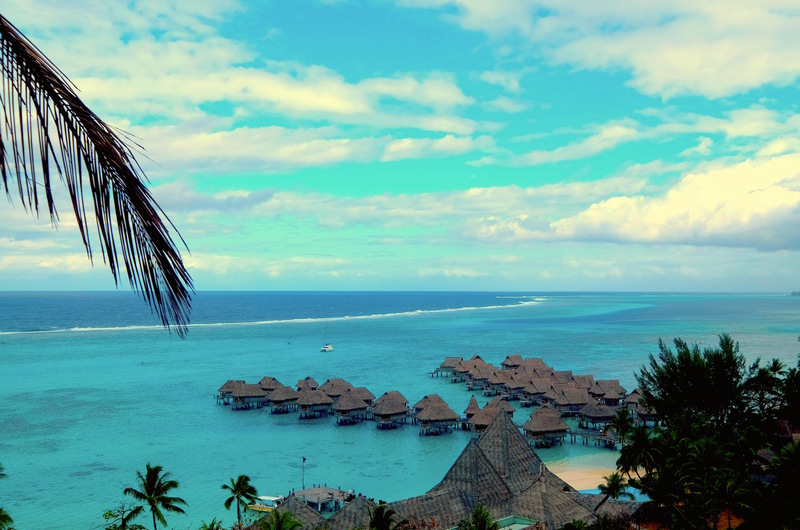 This is the jewel of French Polynesia. 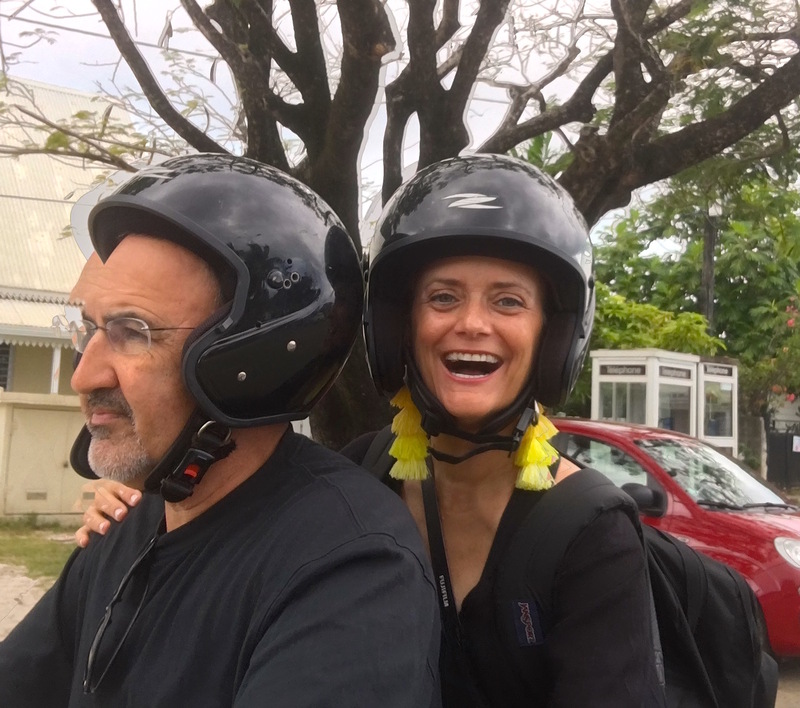 We rented a scooter to explore the island whose natural beauty has captured the hearts of all. Our wheels were rented at Albert Scooter Rental in the center of town. The price for three hours was 4,500 Polynesian Francs/ $45 USD. 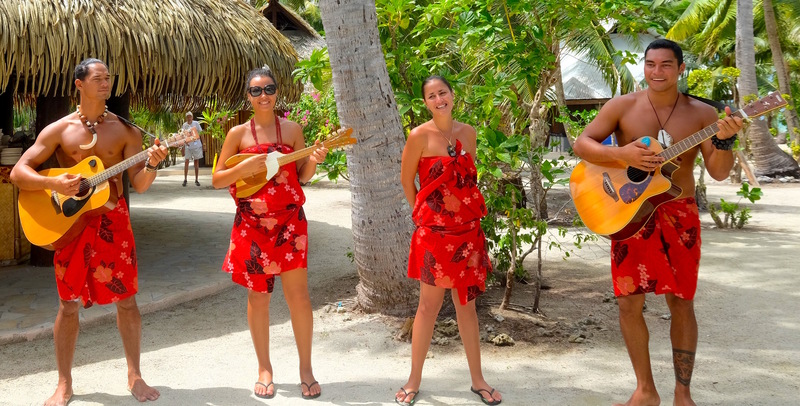 When zooming around Bora Bora we stumbled upon a small seafood shanty run by a French woman and her Tahitian husband. The food was phenomenal! 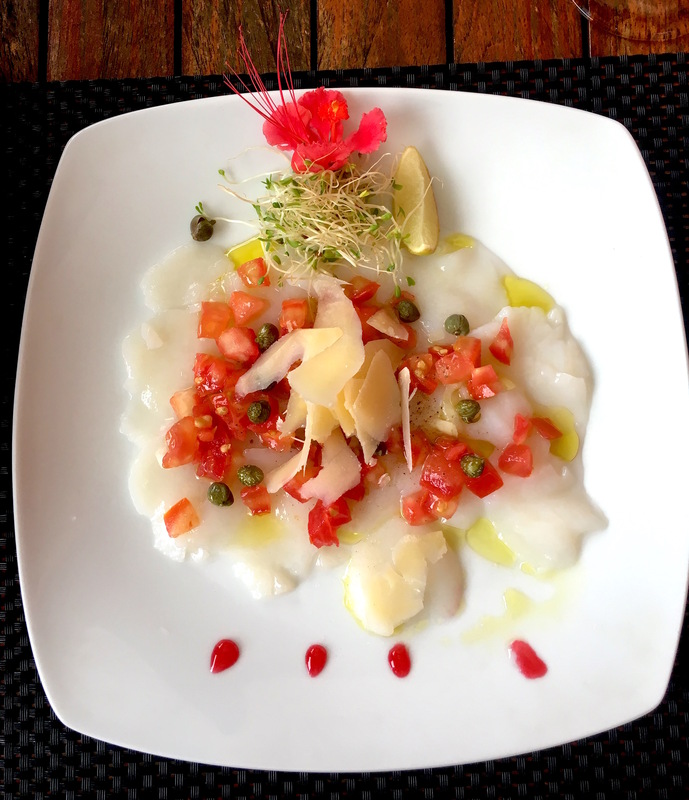 We had scallops carpaccio drizzled with olive oil, capers, fresh tomatoes, and shaved parmesan. It was a joy eating lunch on the patio watching the owners’ 11-year old son fishing in the nearby turquoise water. 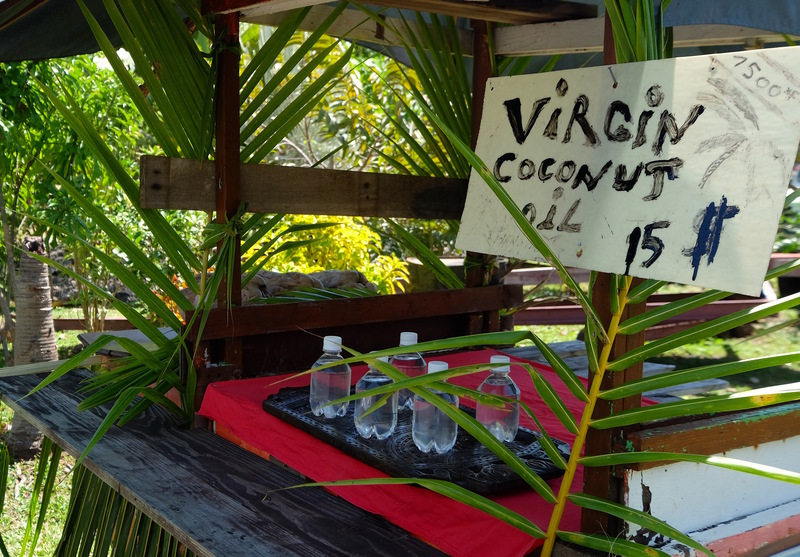 Further down the road an islander set up a coconut oil stand on their front yard. SSOOO cute! The scent was amazingly fragrant; I had to buy a bottle! Around every corner, more beauty. Our two days on Bora Bora flew by and we were off to Taha’a 17 miles east. M/S Paul Gauguin owns a private islet — Motu Mahana — a stones throw from Taha’a for their guests to lounge, soak up the sun and snorkel. Chefs’ prepared a buffet barbecue lunch and served fruity punch, both alcoholic and non-alcoholic, in fresh coconuts. The crew entertained with island tunes. 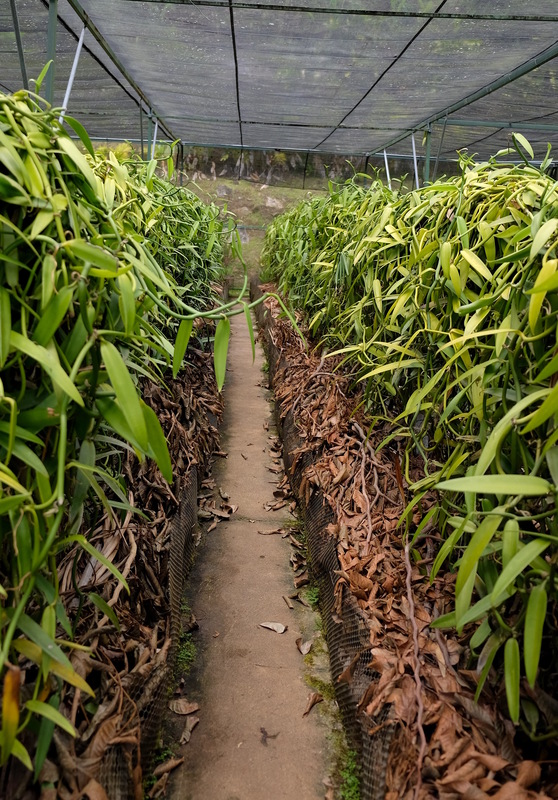 Taha’a is often called the “Vanilla Island” for its numerous plantations of the fragrant bean. The pervasive aroma fills the air. Approximately 75% of all French Polynesia’s vanilla is grown and produced on this 35 square mile island. The vine belongs to the orchid family. 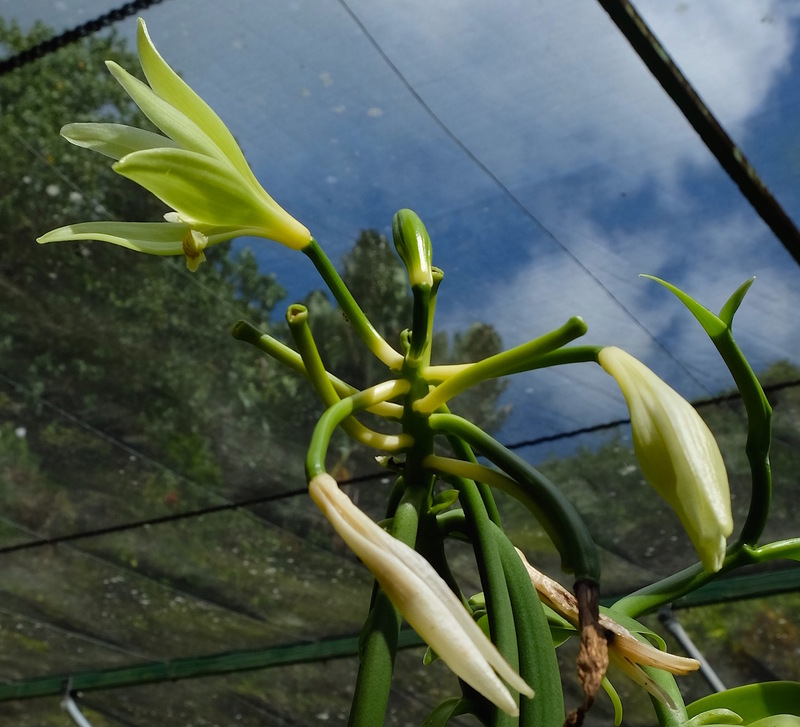 Beautiful white flowers bloom on the plants, producing a pod which looks like a green bean. This bean is harvested and placed in the sun to dry for a few months. Et voila! You have vanilla beans. Nine tons are exported annually, two-thirds to Europe. Most vanilla used in the USA is synthetic. Next stop, Mo’orea, Tahiti’s sister island. Look up “blue” in the thesaurus and you won’t find enough words to describe the insanely gorgeous ocean colors of Mo’orea. 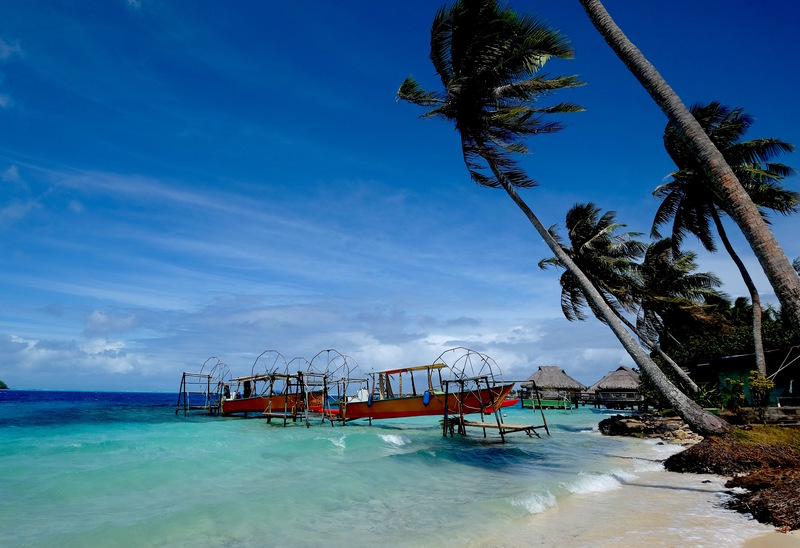 It is one of the 118 Society Islands located a 30 minute ferry ride northwest of Tahiti. The natural beauty makes it one of my favorite French Polynesian isles. Mo’orea is a contradiction in topography. 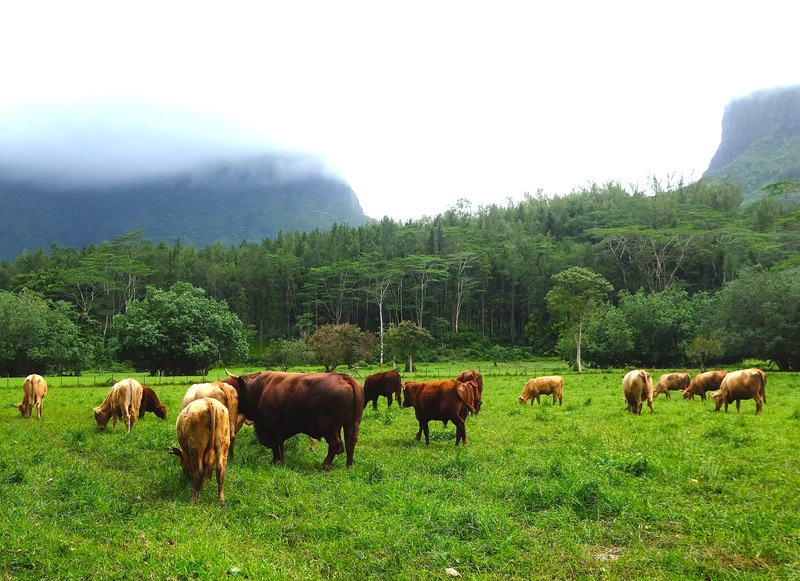 The coast is decorated with palm trees and flowering shrubs, but one mile inland cattle graze on verdant meadows at the base of lush volcanic peaks shroud in mist. Mellowness is an intrinsic part of life here. Tourism is not prevalent. You can drive the perimeter of the heart-shaped beauty in less than an hour. Belvedere Lookout offers views for miles. A stop at Rotui juice factory. 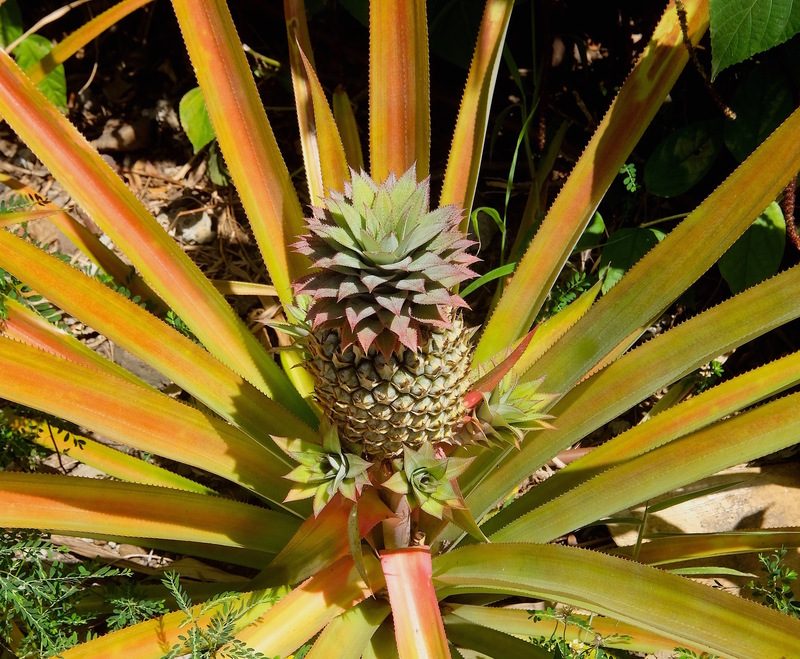 Painapo — pineapple in the Maori language — grows abundantly on Mo’orea. It is harvested and squeezed, resulting in the sweet elixir produced at the local factory and distillery, alongside grapefruit and papaya juice. The small processing plant also cranks out 40-proof brandies and 25-proof liquors made with coconut, mango, ginger, and vanilla. There’s a standing invitation to belly up to the gift shop bar for samples of any or all of the above. Tahiti was the final stop on our cruise. It, like the other islands before, was breathtaking. Busier than the previous destinations, it still had it’s own beauty. 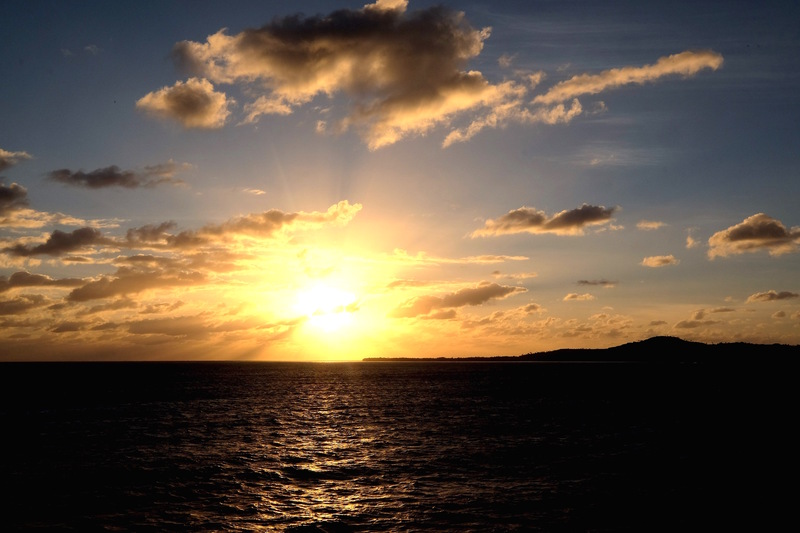 There, we witnessed the most amazing sunsets on Earth. I’m always amazed how frenetic Americans’ lifestyle is compared to, well, almost everywhere else, but especially the islands. For eleven days we took a page out of the residents’ playbook as we slowly traversed two lane roads that dipped, rose, and curled allowing bursts of color to suddenly appear through the windshields of our rented scooters and roadsters. We passed fields of tiara flowers and children frolicking in the ocean with their dogs. We devoured food with no-holds-barred, snorkeled among shimmering fish, and absorbed some of the most stunning corners of the planet. 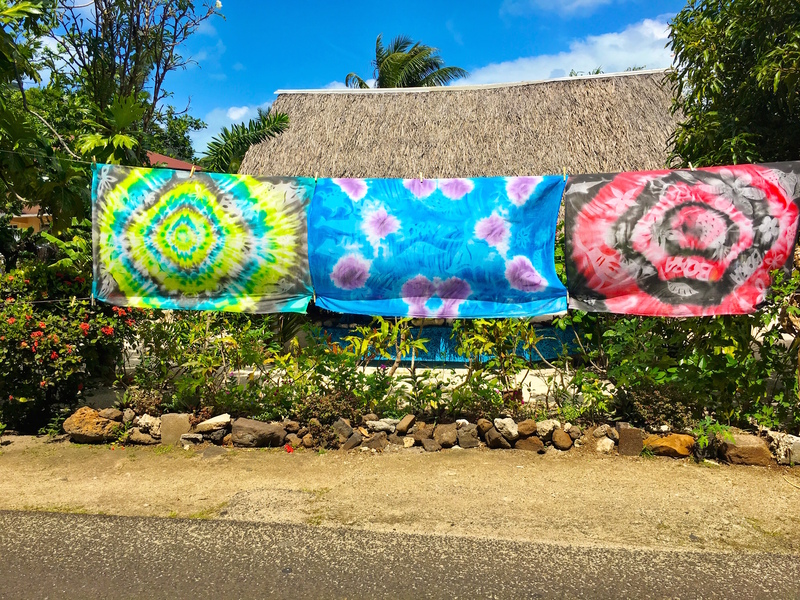 Mauruuru — thank you — Tahiti, Huahine, Aitutaki, Rarotonga, Bora Bora, Taha’a, Motu Mahana, and Moorea for the matchless memories ? ? ? ? ? ? ?. 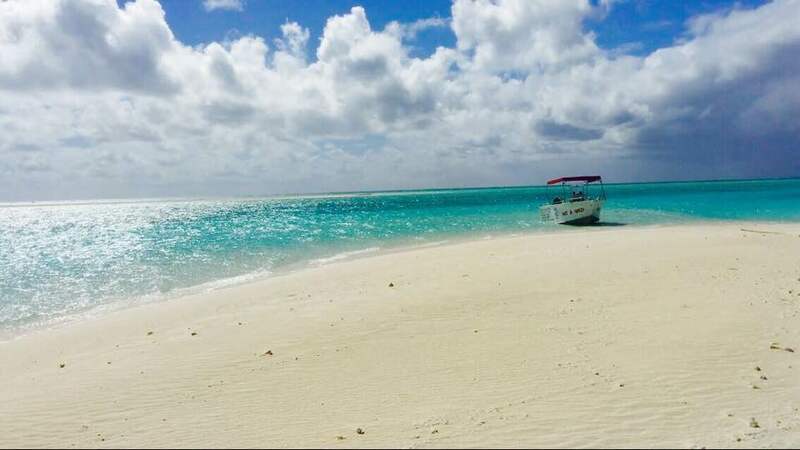 I love the Cook Islands!